Dog Jumping: that little puppy jumping on its owners may appear like an adorable way to greet. Most owners seem to encourage such behavior by praising and petting the cute pup. However, one hundred and ten pounds later, for obvious reasons, that behavior becomes unacceptable. A dog so large may easily knock over an adult and even worse a child, possibly causing even substantial injuries. This is why such behavior must not be accepted from a tender age. Teaching your puppy from scratch not to jump on people can be a pretty easy task. Teaching your dog to stop jumping once the behavior has turned into a habit, is another story. Behaviors that have not been corrected soon enough may be challenging to wean off, as they remain instilled in a dog’s mind. So this is why it can’t be said enough that preventing a behavior early is much better than dealing with it later. In other words, praise your dog and pet him only when he has all four feet on the ground. Should he jump, ignore or even turn your back at him. In a dog’s world nothing feels worse than being ignored. He may try to get your attention a few times more, but you will need to be strict and stick to your guns. Eventually, the dog will come to realize that when he jumps nothing exciting happens. Most dogs are overly excited when the owners come home. You will see them whine, run around and act a little crazy. From now on, you will not greet him when he acts like this. Rather, you will wait a few minutes and praise for exhibiting a calm state of mind. This teaches a dog that he gets attention only when he acts calm and is in a relaxed state of mind. Going coo-coo all over will no longer get him anything. If your dog tends to jump up, wait till he relaxes, once he seems calm,call him to you. Tell him to sit and only once he is still, pet him and praise him lavishly. In this case you need to anticipate him. As you see him running towards you, open your hand and spread your fingers apart. Once he is very close put your hand in front of his face and say firmly “Down”. Your dog will not like your hand in his face and he will quickly learn that this behavior is no longer accepted by you. Again, praise once he is with all four feet on the ground. Another good approach is to take off his balance. In other words, when he jumps up, step backwards so he will lose his balance and get off. Dogs do not like to feel unbalanced and they soon will learn that jumping up is not very pleasant anymore. If you add a command such as “Down” the whole teaching will have more impact and be even more effective. Others have success by giving the dog a slight nudge. This is the dynamic: your dog sees you coming home, runs towards you and as you notice his intent to jump up raise your knee high so that it will give the dog a little nudge on his cheast that will make him back off. You do not have to be harsh, a small nudge is all it takes. A main reason why some people are unsuccessful in training their dog is because they are often inconsistent without even realizing it. An example may be owners that teach their dogs not to jump, but then they play rough with the dog and allow the dog to jump on them in a playful manner. This confuses dogs. They will not understand why the owner one day tells not to jump and the next allows it. Dogs will therefore, think that the rules are not strict or that owners are unpredictable. 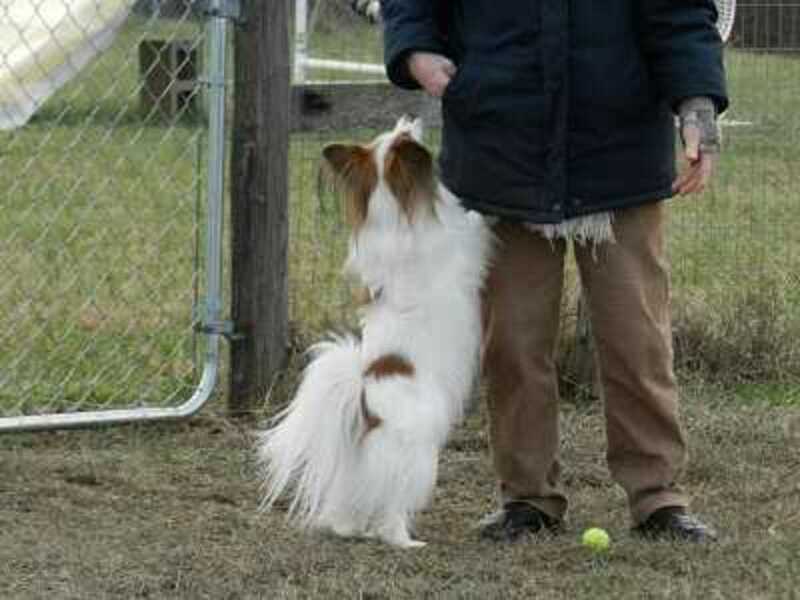 If jumping is not allowed enforce your rules each and every time:your dog will better understand you and respect you. Finally, should these tips still do not work, you may want to consider enrolling your dog in obedience classes. A well trained dog will respond to various commands such as “sit” “stay” “down” and many more. The secret is to incorporate such commands at home quite often. As seen a dog with all its feet on the floor is not only safer, but even much more likely to behave and respect its owners. It may take some time in obstinate cases, but very likely after a while you should see astounding results.